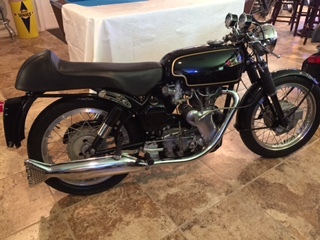 1966 Velocette Thruxton 500CC 4-sreed, total restoration, from the Otis Chandler Museum, recently recommisioned and professionally serviced , upgraded carb to Amal 32mm Premier(original GP carb included), otherwise completely stock and original. Vin #VMT314, pristine condition, original black color, only 1100 built, rare opportunity. Paul Legris, Jupiter, FL. Email: , PH 561-373-9987 Priced @ 34,900.00.